We are here today in beautiful Mpumalanga to launch our 2019 election campaign in this province. We are here to bring you hope. The DA wants to offer the people of Mpumalanga a new beginning, under provincial and national leadership that is honest and committed to improving the lives of all the residents of this incredible province. A DA government in Mpumalanga would be the antidote to Mabuza’s poison. Mpumalanga needs a remedy urgently, because the Mabuza poison has spread to every single part of this province, including to eMalahleni municipality here, which has collapsed into bankruptcy under the weight of his corruption. Fellow South Africans, we are just one heart attack away from having this man as our president. In fact, we may be just one spiked drink away. With Mpumalanga’s record of political assassinations, we would be naïve not to consider this as a risk. In South Africa, the deputy president tends to become president. So, one way or another, we face the real threat of Mabuza as president. And then his poison will infect the whole country, doing to South Africa what it did to Mpumalanga. He will steal the whole country just to buy political power to stay on top. First, Mpumalanga’s education department got infected, when Mabuza was provincial head. Everyone knows that he stole millions of rands meant for schools and schoolchildren and used it to buy political loyalty so that he could accumulate enormous political power. He used that political power as a bargaining chip to become Deputy President of South Africa. That’s right. He stepped on your children’s heads to climb the ladder of power. Do you know that nearly a quarter of primary schools in Mpumalanga still have pit toilets? That’s the price your children have paid for his rise to (almost) the top. As MEC for Agriculture, he infected the land claims process. Do you know that pretty much all land restitution claims in Mpumalanga while he was MEC were fake? He was pocketing the money meant for poor black farmers. The votes of those delegates, bought with money meant for service delivery in Mpumalanga, became his bargaining chip at the ANC’s conference in Nasrec last year. He gave those votes to Ramaphosa’s faction, in return for the Deputy Presidency. He has sacrificed your futures, pushing you down, to get himself to the top. 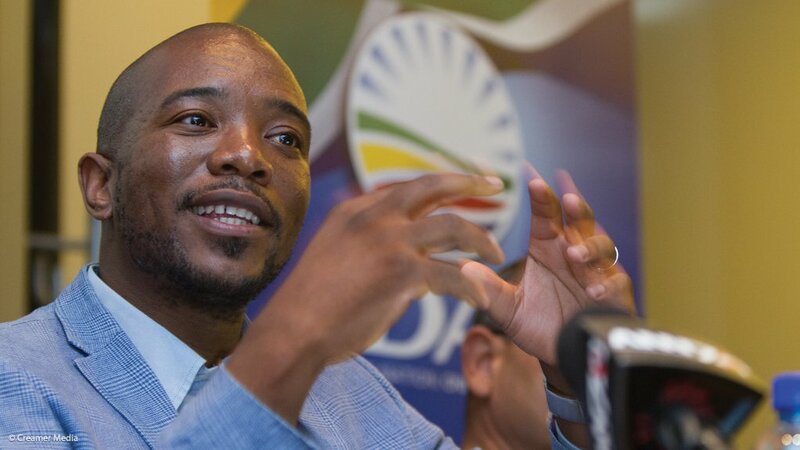 By stomping on your lives and the lives of your children like stepping stones, he has climbed to a position that allows him to infect the whole country, to steal from the national purse, and to shape South Africa’s future for years to come. Is that what we want for our country? For our children? For ourselves? Fellow South Africans, Mpumalanga has been cursed with the worst leadership of any province. Of all the thieves operating in South Africa, DD Mabuza is the worst by far. He even makes neighbouring thief, Ace Magashule, look tame. He is a cruel, dangerous man who will stop at nothing to get ahead. Since 2009, we’ve heard of many, many political assassinations of people who have tried to expose corruption or contest for power. We can all put two and two together and get four. This province could bless its people with good, prosperous lives. But instead, all the news coming out of Mpumalanga is bad news, as if the sun is setting on Mpumalanga. Mpumalanga has been poisoned by Mabuza. All this devastation we can put on Mabuza’s shoulders. And now that there’s nothing left to steal, he is looking to infect the whole country. The DA is the antidote to Mabuza’s poison. Our offer is to fight corruption by giving a 15-year jail sentence to those who are found to be corrupt. Where the DA governs, public money is spent on delivering to the people. We take a zero-tolerance approach to corruption. Our brand is synonymous with clean audits and good governance.